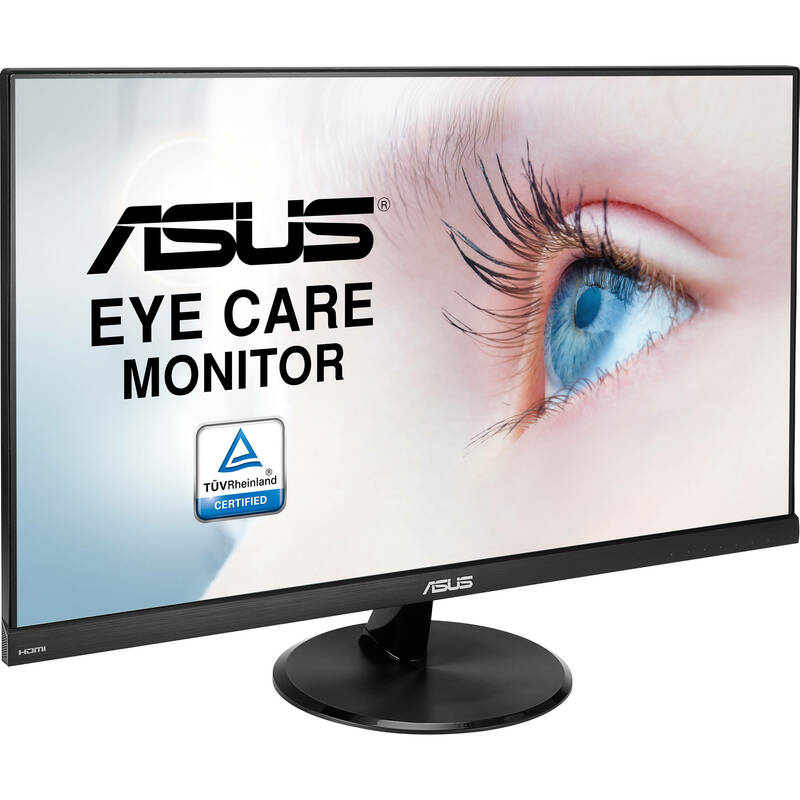 View the screen from virtually any angle as the VP249H 23.8" 16:9 Eye Care IPS Monitor from ASUS offers enhanced 178° horizontal and vertical viewing angles. This IPS (In-Plane Switching) panel features a Full HD 1920 x 1080 resolution accompanied by a 1,000:1 contrast ratio, a 5 ms response time, a 250 cd/m² brightness rating, and support for up to 16.7 million colors to produce a crisp clear picture. Installation is simple as the VP249H monitor comes equipped with both HDMI and D-Sub inputs, making it compatible with a variety of computer configurations. Once configured, this eye care monitor offers both Flicker-free technology and a Low Blue Light Filter designed to lessen the strain placed on your eyes when viewing the screen for extended periods of time. ASUS has also included a variety of video features including SPLENDED Video Preset modes, Skin-Tone Selection, Color Temperature Selection, QuickFit modes, and GamePlus mode, making it easy to configure the display to suit the content being viewed. The GamePlus hotkey enables OSD crosshair and timer functions. Select from four different crosshairs to suit your gaming environment, and keep track of spawn and build times with the on-screen timer. The VP249H monitor features an In-Plane Switching (IPS) technology panel with a 178° wide-view angle that minimizes color shift on both horizontal and vertical planes to ensure quality visuals from almost any direction. With ASUS Smart Contrast Ratio (ASCR) of 100,000,000:1 and 250cd/m² brightness, the VP249H augments display contrast and sharpness by adjusting backlighting luminance to achieve deeper blacks and brighter whites for more lifelike visuals. The TÜV Rheinland-certified ASUS Blue Light Filter protects you from harmful blue light, and you can easily access its four different filter settings via a hotkey. The VP249H has undergone stringent performance tests and has been certified by TÜV Rheinland laboratories, a global provider of technical, safety, and certification services, to be flicker-free and to emit low blue light levels. The VP249H features TÜV Rheinland-certified ASUS Flicker-free technology to reduce flicker for a comfortable viewing experience. This technology helps minimize instances of eyestrain and other damaging ailments, especially when you spend long, countless hours in front of a display watching favorite videos. Photo: 8x10", 5x7", 4x6", 3x5", 2x2"
Box Dimensions (LxWxH) 23.7 x 18.5 x 5.0"
VP249H 23.8" 16:9 Eye Care IPS Monitor is rated 4.7 out of 5 by 3. Rated 5 out of 5 by Dave D from Great Quality Monitor, resolution, colors Was looking for a monitor to hook up my new laptop (Lenovo Flex 5) with an HDMI cable and get a good resolution screen to work. Had an old samsung TV before and the resolution was working with the HDMI connection (worked with the DVI only). I also have a desktop I connected with the VGA connection. Really easy to switch between computers on this monitor. The screen also does seem to have less eye strain than others I have used. Great quality product, anti glare screen. Only the VGA and HDMI inputs though. Rated 4 out of 5 by Khanage from ASUS VP249H 23.8" 16:9 Eye Care IPS Monitor I no longer suffer from eye strain.? The colors are a little off from normal and I haven't been able to correct this yet. Rated 5 out of 5 by Lopez from Awesome Monitor I bought 5 of these monitors and the are great. They are bright and handle well.